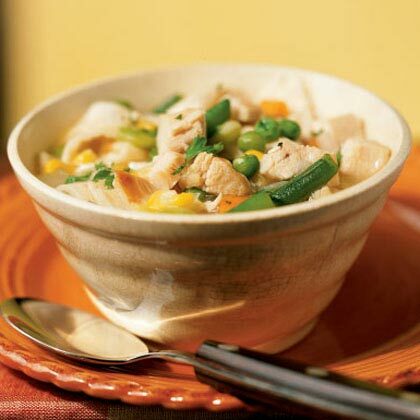 This is a great chicken and dumplings recipe for those cold winter days, or those warm summer days if you are a chicken and dumpling enthusiast.. Please Note that this recipe requires dumplings. If you don't want to buy dumplings and would rather make your own, just follow this link for a simple dumplings recipe. Mix togeter the chicken breasts, the soup, green beans the potatoes, carrots, peas, butter and diced onion together in a big saucepan or even better a slow cooker. Fill the pan, or slow cooker with water, just enough to cover the ingredients. Turn on heat to a medium and let in simmer gently for about 5 Hours. 5 Hours later and it should start to smell lovely. Add your dumplings dumplings and then let it cook for another 30 minutes and serve.